It may have only been a few weeks since we ate here but a new menu awaits. 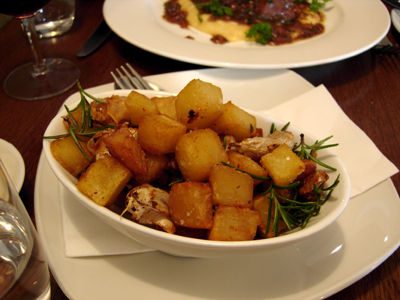 We end up ordering a starter to share from the Bar menu and our mains from the cafe menu. 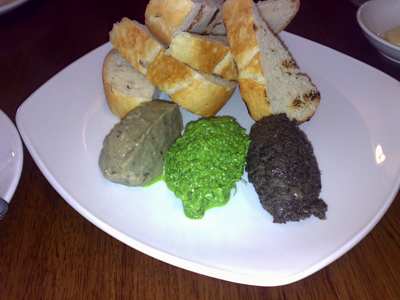 Three dips with toasted bread - a choice of mushroom, spinach and fetta and eggplant dips. 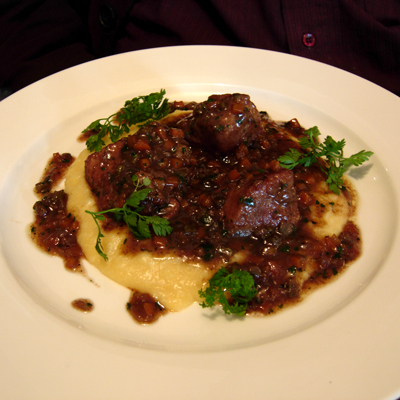 Wild Boar cooked in red wine and vegetables and served over soft polenta. After not seeing wild boar on any menu we now see it twice in the matter of a month. The boar is quite a dense meat and seems very low in fat but the long slow cooking ensures a tender product. Paalo thoroughly enjoyed this dish, the polenta providing an excellent vehicle to enjoy those braising juices. 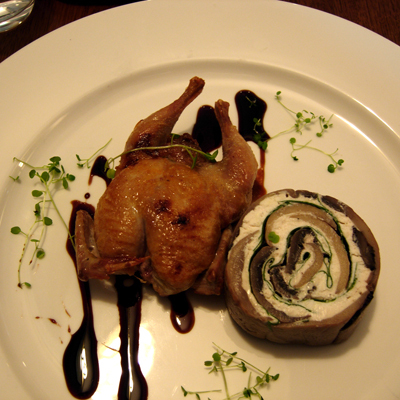 Boned Quail served with a mushroom and goat cheese roulade. Obviously my choice as I find it almost impossible to not order quail. This is an entree and quite a generous size. The quail was well flavoured, the skin lovely and crispy - the roulade is cold but is packed with flavour. Fragrant and wonderfully crisp - you couldn't really prepare this dish any better than this. Paalo took the time to have a good look at the wine list - it's actually quite an interesting list with many unusual wines on offer. It's also refreshing to see that the wines offered by the glass are also not those mainstream standards. All the wines available by the bottle are over $35 bar two that were around $32. Oh what beautiful photos! Looks like an absolutely delicious meal. What are the prices like at The Undertaker? Thanks Truffle - the dips were from the bar menu and I think they were around $7, I think my quail was about $15 and the boar which was a main was $32. Mains range from the mid 20's to mid 30's, entrees from low to high teens. The fact that Canvas is just across the road means that they share similar prices.